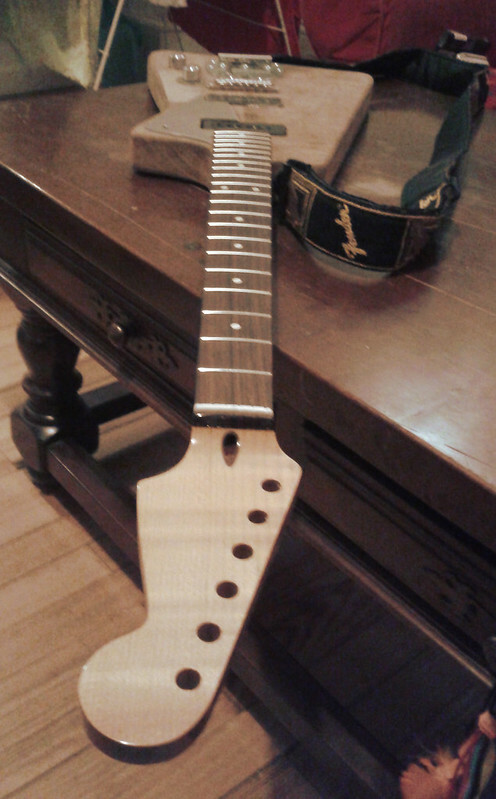 This is my first guitar with a wraparound, so I'm not sure that I'm qualified to judge. 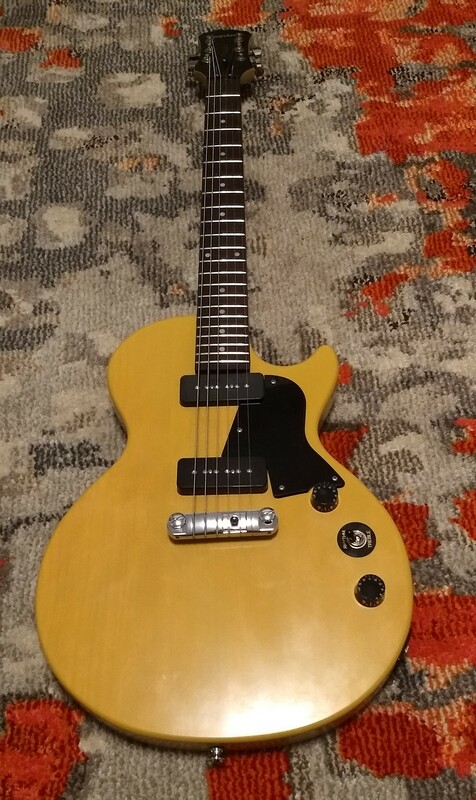 But, it is certainly an improvement over the factory bridge - it feels more solid and is smoother under the hand and the tone is clear with tons of sustain. Can you post a better pic of it? How does it feel in playing position? Have you made this shape before or is it a one off? Did the customer end up satisfied? ...finally getting around to dowelling a bunch of worn screw holes. Reluctantly building myself a pickup winder because I've got an almost dead Dynasonic which I really don't want to get lost in the post. Luckily I still have my old Meccano set. 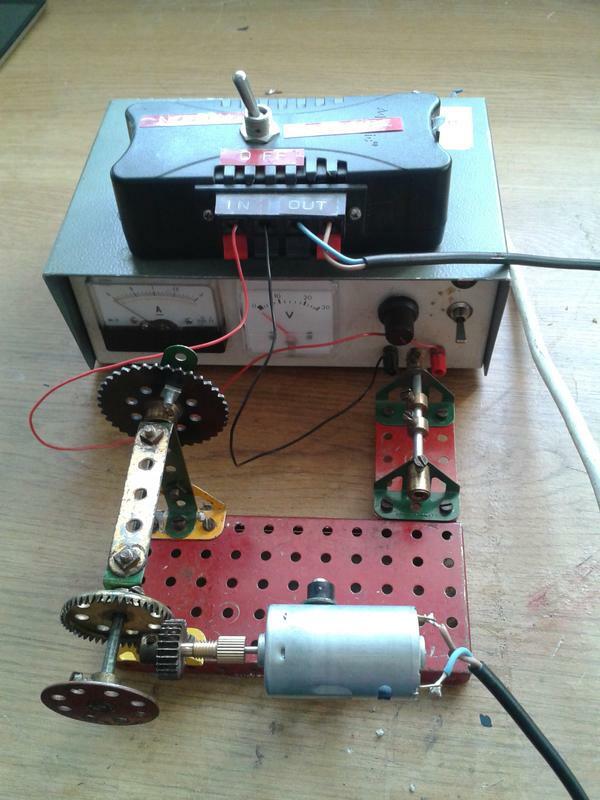 The motor is only from a PCB drill, but it's not like I need very much torque anyway. Just need to figure out some kind of counter, which will probably be the tried and tested calculator-and-reed-switch trick. sweet. if your looking for some bobbins to practice on, i have a set of jazzmaster bobbins that need rewound. The calculator-and-reed-switch way works, but it can be a royal PITA to set up correctly and will limit your winding speed to a few hundred RPMs. Depending on how often you want to wind pickups, I'd recommend a mechanical counter and timing pulleys/belt. You can find them for cheap on eBay (get NOS rather than Chinese, those are pretty bad) and they can handle fairly high speeds. PM me if you want specific references . You know, I might take you up on that, but I have zero experience rewinding pickups so I wouldn't feel that great about practicing on other people's stuff right off the bat. I've got a dead Super Distortion in my junk pile that I'm going to try first, if I find I can actually do a decent job of it I'll let you know. Yeah I've heard from a few different websites that it won't register properly over a certain RPM, but it's my first time rewinding a pickup so I'll be going hella slow anyway. 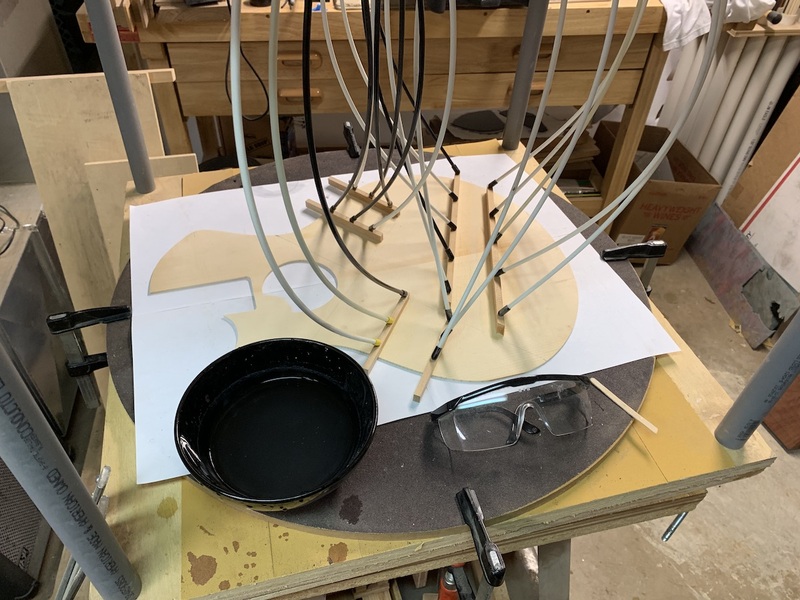 At the moment I'm not planning on rewinding any other pickups after I'm done with the Dynasonic, but if I do end up rewinding stuff regularly I'll build a proper machine with a decent counter. Thanks for the tip about the mechanical counter though! keep me updated on how it goes then. p.s. 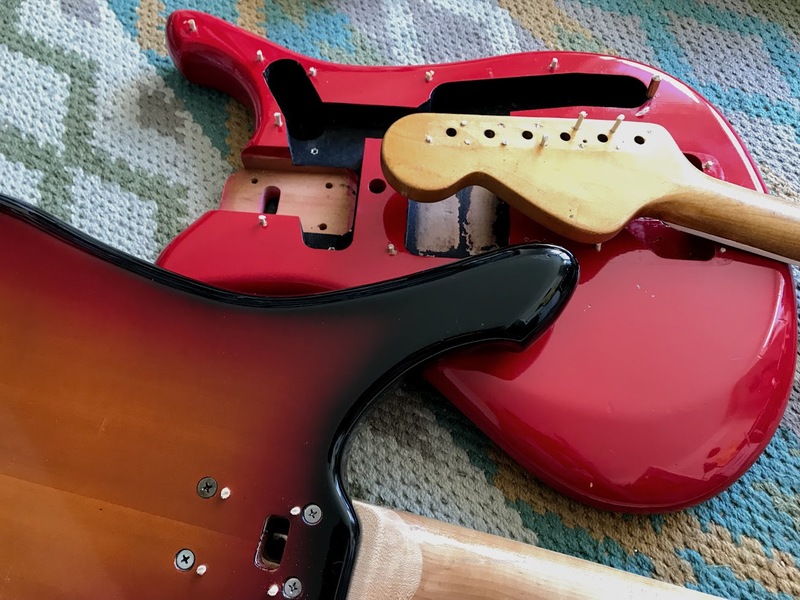 i also have a few dead pickups in my spares draw if you want em to practice on and we can consider it payment if you decide you can do my 2 jazzmaster bobbins. I'm waiting on the finish shop for my green Jazzmaster body, and on good weather so I can carry on with the finish on my IBM JDR build. Here's a thing that's been on my digital workbench (and soon to be on my physical workbench). I've been trying to come up with my own "original" body shape for potential P90 and Filter-tron builds. 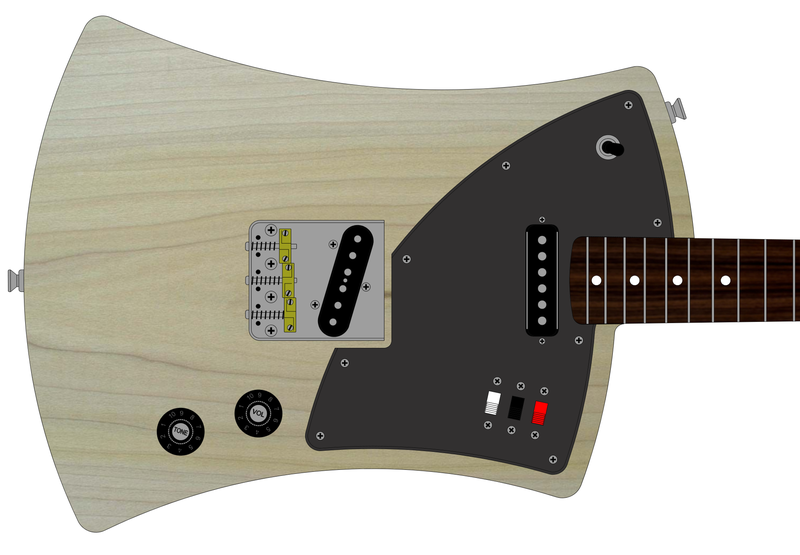 This is inspired by LP Special single cuts, the Musicman St. Vincent, Gibson's experimental 50s shapes, and various guitars I've been seeing on Pinterest. The idea was to create a simple silhouette with no complex curves. The waist is offset 11 degrees. The general shape came from sketching over a JM outline that I printed out. I'm planning on building a budget prototype (shown below) using as many on hand parts as possible. I have a poplar blank on the way and will do a basic wipe on poly finish. 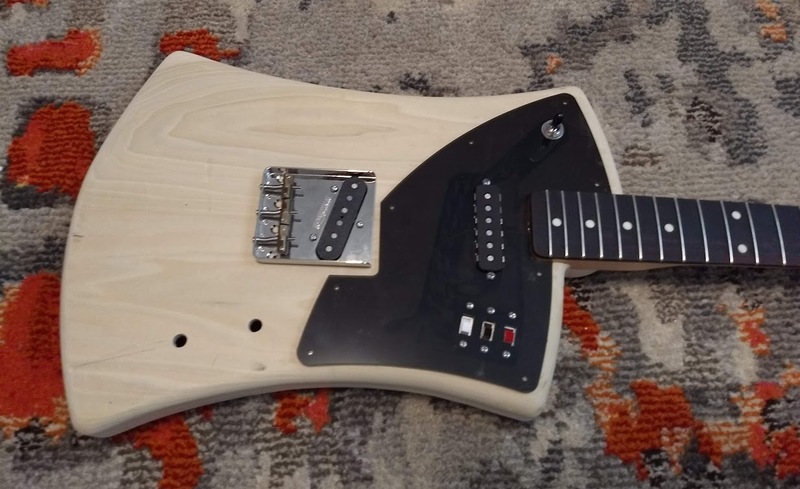 Pickguard will be laser cut dark grey tinted acrylic. 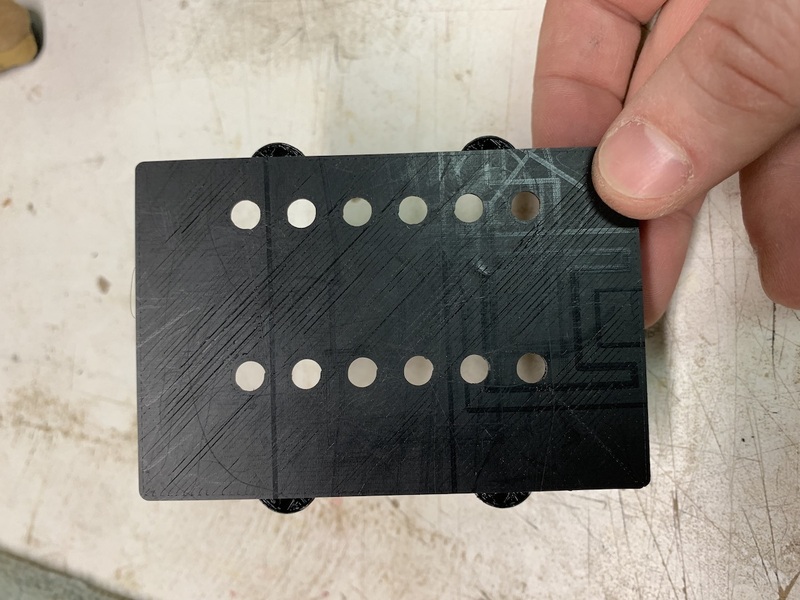 Tele bridge pu and a Squier VM Jag pickup in the neck, with one of my 3d printed covers designed for pickguard mounting. 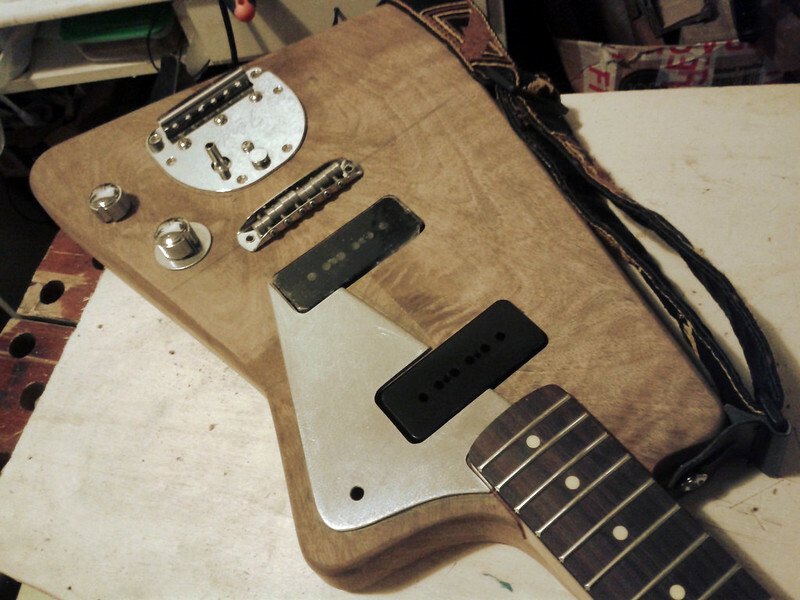 The three slide switches will be Series/Parallel, Rhythm tone, and Strangle. This should come together quick and cheap. If I'm happy with the shape, I'd like to do a super sparkly Gretsch inspired build. Just a little acoustic top making and a little 3D printer experimentation. Top is for a "stage acoustic" (read: thin, fully hollowed 2" thick body with acoustic top on it) commision. Fit was a little tight on the JM side so I'll have to fix that. Otherwise it was perfect! I may also play with a version that allows for the jaguar's claw to still attach. There's still a little bit to do, but I'll be able to try it out soon.